soaring free spirit continues to inspire. I was very excited to discover this 2014 documentary on New York fashion icon Iris Apfel was available on iTunes. Images showcasing her unique fashion sense had crossed my path many times, and she was one of the women featured in the documentary - Advanced Style (link to preview clip). I had no idea someone had created a solo documentary on her and couldn't wait to check it out. Last night was the night. This entertaining tribute to her originality was created renown film maker Albert Maysles, who was 87 at the time of filming. Apfel was 93 (and her husband turned 100 during filming). Maysles has since passed, but Arfel, now 94, seems to still be going strong. All through the movie I was drawn in by her truly unapologetic approach to life. She wears what makes her happy - often burdened down with layers of necklaces and wrists heavily draped in an assortment of large bracelets. Then there is her trademark large goggle-like glasses in several shades. I love the way interviewer Megan Conner of The Guardian described her after their interview as, "Charmingly rude, brilliantly abrupt, wearing gigantic owlish glasses and necklaces that look like pythons sliding around her oesophagus, Apfel is the kind of rare nonagenarian people want to keep hold of." I want be here when I grow up. Apfel's wardrobe fills several rooms in her New York apartment, fills her mother's apartment and her Palm Beach residence as well. The oldest thing in her closet? The dress she wore 68 years ago to go on her very first date with her husband, Carl. She has been an avid collector of accessories in particular all her life and states it's always been more about how the piece captures her imagination rather than the price. That doesn't mean there aren't vintage top designer garments and jewellery in her collection as well. She loves colour, she loves pattern, she loves variety, she loves making a statement - just my kind of female icon. One part of the documentary I enjoyed was when she was brought into Loehmann's on her 90th birthday - the store's 90th anniversary as well - and was asked to share her thoughts as well restyle some of the young women in the audience to reflect her own edgy vision. They all looked amazing and were absolutely happy with their new look. At least one admitted she never would have tried that garment on if she had seen it on the rack. I also had no idea there had been a curated show featuring her collection. It began as a fill in for a show that fell through. Needing a quick replacement, one of the curators at The Costume Institute in The Metropolitan Museum of Art called Apfel in desperation. He had borrowed pieces from Apfel several times over the years to use in other shows. Would she again be interested? Of course! While the exhibit's original focus was on her accessories, they decided to have the pieces displayed on full looks created by Apfel from her extensive wardrobe. According to Apfel, they asked for five outfits of her choice, styled with jewellery of her choice. When she asked them what they wanted, the response was they didn't know. "And that opened a Pandora's Box." 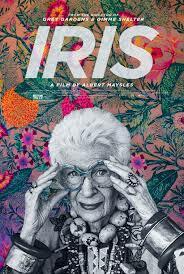 Rara Avis (Rare Bird): The Irreverent Iris Apfel premiered on September 13, 2005. There were no sponsors which meant no money for advertising - yet attendance grew daily. driven solely by word of mouth at first. While insiders knew who she was, many had no clue and the media stepped in to conduct countless interviews. The exhibit was such a success, a traveling version was created that showcased at the Norton Museum of Art in West Palm Beach, the Nassau County Museum of Art in Roslyn Harbor, and later at the Peabody Essex Museum in Salem. Other highlights for me were watching Apfel and her husband peruse the tables at a swap meet. Carl ended up getting studded red baseball cap. She also created a line of jewellery and had to appear on the Shopping Channel - it sold out of course. Lastly was a walk through the dusty loft where she stored treasures accumulated during years of travel. I have to admit it didn't look well organized and a bit of a fire hazard - but still interesting to see some of the treasures stored there. 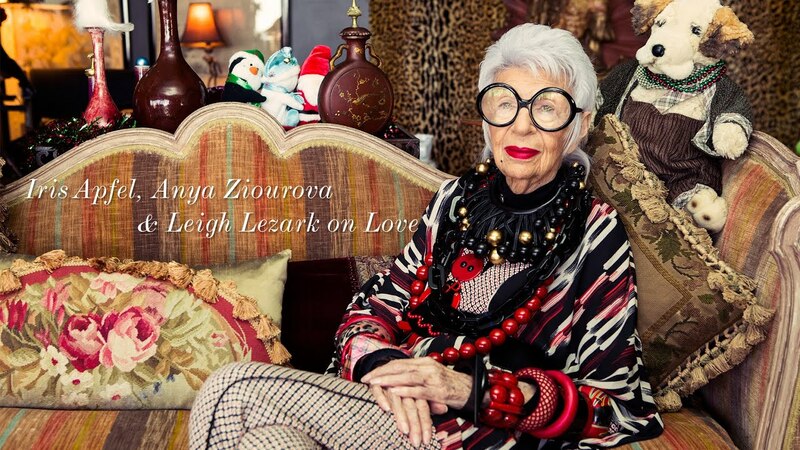 I have decided I want to learn to channel Iris Apfel's irreverent style - both in fashion and life. I find myself totally inspired. In closing, I thought I would share some favourite quotes. Quotes from Iris Apfel - 18 True Gems on Fashion and Life! Style is attitude, attitude, attitude! If you can't be pretty, you have to learn to make yourself attractive. I found that all the pretty girls I went to high school with came to middle age as frumps, because they just got by with their pretty faces, so they never developed anything. They never learned how to be interesting. I don't care what people think…I learned that I have to go to bed with myself at night and that I have to please myself…and as long as I don’t go out of my way to offend anybody that I love, upset my mother or my husband…I’ll do my own thing. And if the public doesn’t like it, it’s their problem, not mine. I never just went to look for clothes and style; I always find that wherever I go. I'll spend more time getting dressed than I spent at the actual event.